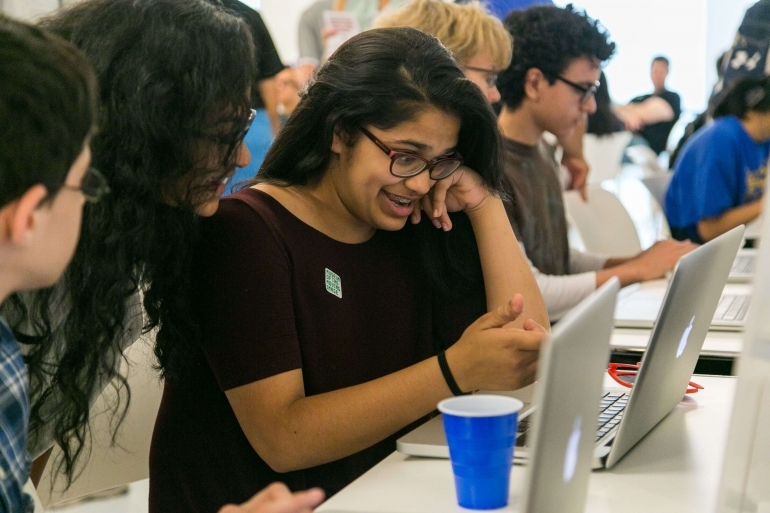 Mouse students in 20 NYC schools have been working hard all year to create Serious Games as a part of the second-annual Games for Change Student Challenge! 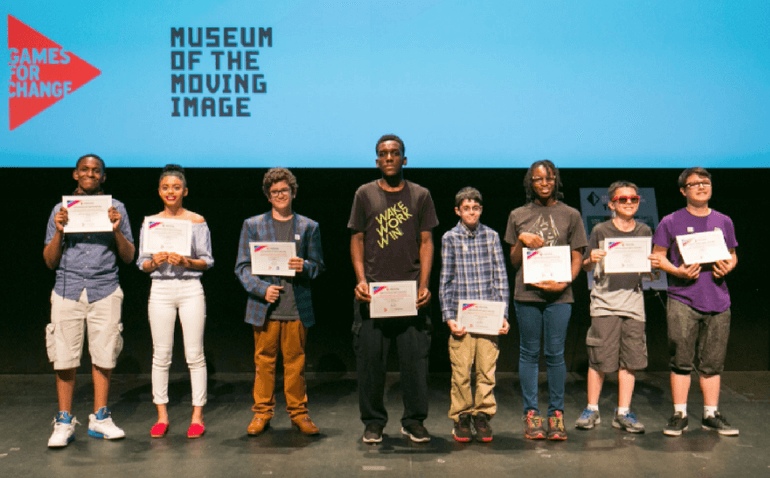 On June 10 Games for Change hosted an awards ceremony at the Museum of the Moving Image and we were excited to find out the which games would take home prizes for being the best games. Nearly 200 attendees came to celebrate the finalists and winners, including families, siblings, teachers and tech professionals. All 25 finalist games were showcased in an interactive arcade, with students there to demo their games, followed by an awards ceremony in the main theater. Three teachers presented on their experiences during the year and prizes were presented to 10 winning game teams. 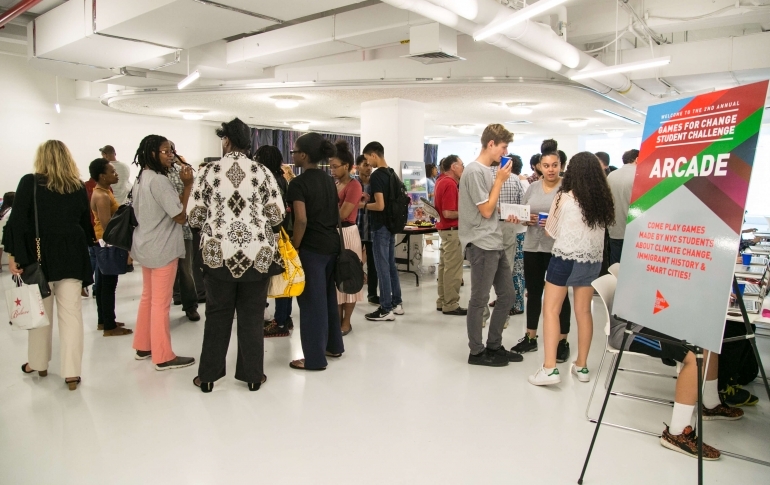 Prizes included Ubisoft games, Android tablets, a tour of the NYU Game Center and behind-the-scenes tours of AMNH, Museum of the City of New York, New-York Historical Society and walking tour of DUMBO, Arduino boards and LED light bulbs. Games for Change captured some of the event on Periscope video, so check it out to see the awards ceremony! In addition to winners for each theme, two games were selected to be the overall Grand Prize Winner and one Runner Up. The Grand Prize winner, Adventures in New York, was created by a middle school student about his Slovakian grandfather's arduous immigration into the U.S., inspired by the theme of Local Stories & Immigrant Voices. Sean's parents and grandfather were in the audience, and were emotional and overjoyed for his game and family's story to win the overall prize. The Grand Prize Runner-up, Green Hero made by high school student Geneva, gave a great explanation of her game design process and goal of encouraging people to clean the planet. Congratulations winners, finalists and everyone who participated in the challenge! We had such a great time and we hope you make amazing games again next year!